In an interview with 2 participants, speakers’ contributions can be labelled automatically as such at the beginning of a paragraph and individual letters can be replaced by any text. When transcribing a recording with two speakers, you can switch on the automatic speaker change in the transcription settings. As a result, each new paragraph begins automatically with a freely definable name, pseudonym or abbreviation. Select the option Automatic speaker change in the “Transcription Settings” dialog window. Enter names for each speaker. It’s a good idea to add a space on the end too. Select the Bold option if you want to want to pu the emphasis on one name. If you can’t see the transcription settings, you can open it by clicking the Transcription Settings icon on the left side of the “Multimedia-Browser”. 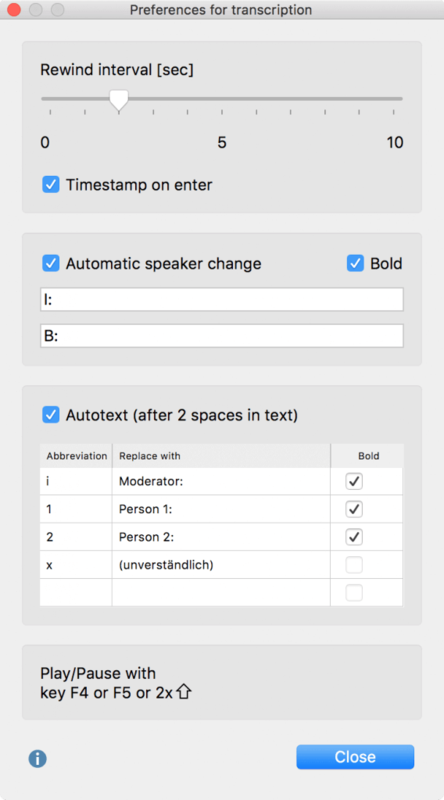 If the names of the two speakers are marked “I:” and “B:”, the next name will be entered automatically for each paragraph change in the transcript and save you a lot of typing. In the “Transcription Settings” you can also define abbreviations, which are automatically replaced by text when two spaces are entered. This is particularly useful when you transcribe a group discussion with several speakers, because then the names of the participants can be filled with shortcuts and you can save yourself a lot of typing. Likewise, you can also use frequently recurring and difficult to type transcription elements with brackets, e.g. “(Incomprehensible)” or “(2)” for 2 seconds as autotexts. The autotexts shown in the following picture are defined for all new MAXQDA projects by default. The abbreviations can be up to one letter long. You use the “Bold” setting to control whether the text is inserted in bold script. The autotext is stored in your project so that you can also use different computers with MAXQDA installed for transcription without having to reenter your required autotexts. A total of 15 autotexts can be stored. 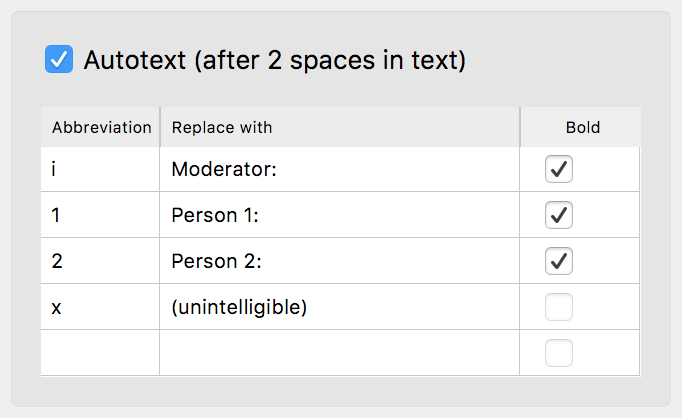 The entire autotext function can be switched off by deactivating this option in the “Transcription settings”.